Very pale, clean, bright and minerally, good fruit in the mid-palate and a shapely, refreshing clarity of purpose – lovely summer white for those summer lunches with starched linen tablecloths. Hand picked, the wine is produced mainly from the Verdicchio grape to which it is permitted to add small quantities of Malvasia and Trebbiano. Pairing with Coniglio in Porchetta (if you just happen to have a rabbit and a suckling pig to hand) or with fish, lunch, or simply as an aperitif. 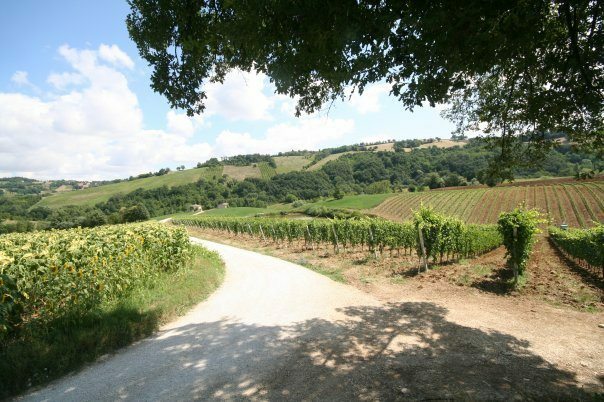 Found between Apiro and Cupramontana, right at the heart of the lands of Verdicchio, the territory of Apiro is ideally placed on a hill at the feet of Mount San Vicino (m 1479), at an altitude of 516 m above sea level, with just more than 1500 inhabitants. The landscape is wonderful, a green valley with tilted slopes, covered with beautiful woods and vines, marked by the high peaks of Gran Sasso and Maiella that stand out towards the horizon in the south and the the peaks of Mount Catria that are found to the north. 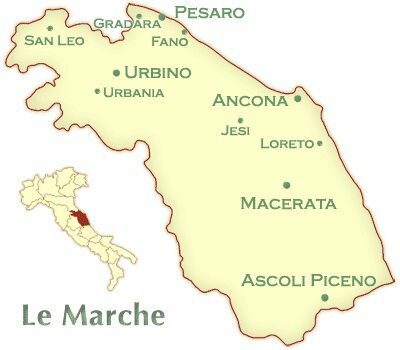 Le Marche is the territory extending from the Adriatic sea to the Apennine mountains, comprising of valleys that are in some areas narrow, in others gently sloped and invariably swept by air currents. At altitudes in some cases considerably high above sea level, this wine growing region is endowed with very favourable daily temperature ranges. Verdicchio wines from Castelli di Jesi are renown as some of the best wines of Le Marche. To top up your wine rack for summer evenings and also receive free nationwide delivery (for orders over £100) we’ve also added below a brief list of some of our current Italian favourites of the moment. Thank you ! I am so pleased that you are enjoying Leo’s wines and Leo is of course, thrilled to have them with all of you ! Let’s all hope for a little more sunshine so that we can enjoy a bit of Summer Weather and the good things that are hand in hand with the Season !